When I was a kid there were a lot of “kiddie parks” around. They were basically like a permanent carnival. A mini Disney Land that was only a few minutes drive away. While thinking about what to write for this post I started looking up the places that I remembered going as a kid. The last one in the area closed up in 2005. It makes me kind of sad now… if I would have known it was still there and was going to close I would have gone one last time. …maybe i have a boring childhood, because i can only remember going to an amusement park a few times only. Duck season? Oh god, I gotta get outta here! 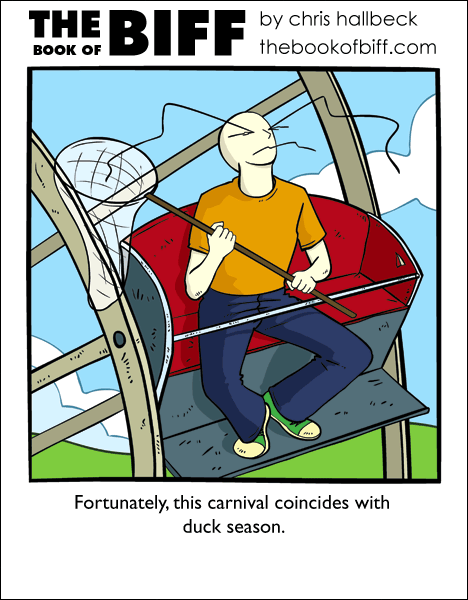 I’m pretty sure that there’s a reason that no one but Biff hunts ducks with a net, but then again being pulled from the top of a Ferris wheel by a duck is probably safer for Biff than handling firearms. Judging by the apparent stability of the ferris wheel, what with the wheels made about as thick as Biff’s fingers, getting a duck in a net would likely bring the entire thing down. Judging by all the previous comics, however, that is likely Biff’s plan. On that subject, a net is far more efficient than, say, giant tongs. Sorry for the double post, but “dispensa” apparently means legal in Spanish. Man, I love how I am constantly reminded of Biff’s geniusness. I know how it is to have those places shut down. I used to go to an amusement park when I was a kid that was literally, only three miles away from where we lived. But it closed down in 1985. Now the closest one is just over an hour’s drive away. I miss that amusement park so much I worked on a Wikipedia entry for it. One like that just closed near here in Oregon. I had only been there once, and it was very recently after I had been to Six Flags, so the main roller coaster was like a total drag, but the wheel with the cars that had the breaks was cool. The cars would stay upright unless you hit the break then the car would lock in place to the wheel. If you did it right, you could break and release just right so on the underswing the car was trying to right itself but actually stayed upside down. My friend and I did this enough times and they attendant let us stay in the rise because there wasn’t a line. I didn’t throw up, but I was totally not feeling good the van ride home. When I was a kid my dad lived in Windsor, Ontario (still does, as a matter of fact). There used to be an amusement park not far from there called Boblo…I discovered my fear of heights on the log flume ride. Boblo shut down in 1993, and now the island it occupied is a luxury housing development. How things change. Sorry Biff, but all the ducks are in line for the “Hit Fabio in the Face” ride. I had a small theme park near where I lived as a kid and it closed up mere months before I gained the courage to go there, only to discover it had been closed. It had the only roller coaster I ever dared to ride (It was nice and fast but had no loops or twists or huge drops… it was an old fashioned wooden one), and alas I never got a chance to. I know how you feel! Though at least you had no idea they were closing, nothing’s worse than knowing it in advance and never getting round to going. You only have yourself to blame then after all. he needs a duck friend. Who’s the idiot who let Biff on that ride with the net in the first place? Sometimes, the nostalgia is worth more than seeing it again. If you went shortly before it closed down, it would probably have been run down, and everything would be smaller than you remember. Everything’s magical when you’re a kid. @BlueDragon: Some minimum-wage teenager who didn’t know any better. As for where “Dispensa” comes from, my best guess is La Vecchia Dispensa vinegar(Italian). Also, my Spanish dictionary says “dispensa” means “dispense”. Since people are having fun guessing I’ll point out that nobody has discovered my real reason for using the title Dispensa yet. But it’s Wabbit Season! No wait! It’s Elmer Season! @Chris: Ok, If this is the reason my head will explode because it was simply the first thing that popped up in wiklipedia. Here’s my guess: Dispensa’s Castle of Toys, which was once an Illinois landmark but is now a bunch of office buildings? It looks more like he’s hunting butterflies. Still funny though. @Gobbledegook – Yep that’s it. The important part is the last line of the entry. Dispensa’s Kiddie Kingdom was the mini amusement park that I went to all the time as a kid. PsychoDuck, you should lay low. Any minute now someone is going to start posting under the name “Elmer”, and then it will be too late for you. Vamoose! Last weekend we took our kids to the Tilt-a-Whirl, Carousel and mini-train I LIVED on as a kid. It was still awesome and the little troll of a guy running the Tilt-a-Whirl still responds to “Faster! !” and to screaming. He has the gift to zoom the car he targets. The carousel was purchased in 1956 and was 30 years old then. I love that it is all still running. We have a few amusement parks in my area (Ohio, for those not in the know). Maybe you’ve heard of them. We’ve got The Beach Waterpark, King’s Island, and Cedar Point. King’s Island, by the way, is home to the tallest, fastest wooden coaster in the world, The Son of Beast, in addition to the longest, The Beast. That is REALLY obscure, Chris! But my guess was good, too. Since Dispensa is legal in espanol, then it can stand to reason that it was all about Biff being legal to hunt ducks. The concept of display pictures is interesting though. @kmurphy, is your s/n a reference to Karrin Murphy from The Dresden Files? first time commenter, long time watcher here! The carnival i went to as a kid still exists…its past its golden years sadly. Its located near the ocean..about an hour’s drive from my home. I do miss the sand art stand they had…and this one were you would squeeze paint on a spinning piece of white paper/cardboard…haha. those little works of art always got covered in sand by the end of the day. no more though. Still, i try to visit the place at least once during the year since their awesome 4th of july fireworks hasn’t changed….the park though is smaller now…Lot of my favorite rides and games are gone 🙁 games have gotten expensive too. heck i remember when it cost a quarter to play one of their games… now its like two dollars. Bleh. hm…its been awhile since i visited but, when did the bookofbiff site become covered with advertisements? i understand they are needed to run the website…but…it caused my internet to crash twice. I dont like it when my internet crashes trying to load biff 🙁 Any-who great comic as always chris. @Micah: As much as I love Dresden, no. Murphy’s waaay tougher than me!